(CNSNews.com) - The Congressional Budget Office’s budget and economic outlook released this month projects that real Gross Domestic Product will grow by 3.3 percent from the fourth quarter of 2017 to the fourth quarter of 2018. That would mark a 15-year high. The last time real GDP grew by more than 3.3 percent from the fourth quarter of one year to the fourth quarter of the next was in 2003, when it grew by 4.4 percent, according to the historical data published by the Bureau of Economic Analysis. “In our economic projections which underlie our budget projections, inflation-adjusted GDP--or real GDP--expands by 3.3 percent this year, and by 2.4 percent in 2019,” CBO Director Keith Hall told the House Budget Committee in testimony on April 12. “Most of this growth is driven by consumer spending and business investment, but federal spending also contributes a significant amount this year,” he said. Hall testified that the tax law signed by President Donald Trump at the end of last year is stimulating economic growth. CBO’s budget outlook noted that CBO had increased its projections of economic growth for this year and next year. “CBO significantly boosted its projections of the growth of real GDP in 2018 and 2019, mostly because of the recent changes in fiscal policy,” CBO says in its “Budget and Economic Outlook: 2018-2028. If real GDP grows 3.3 percent from the fourth quarter of 2017 to the fourth quarter of 2018, as CBO projects, it would be the greatest fourth-quarter-to-fourth-quarter growth since 2003, when GDP grew by 4.4 percent. In 2004, it fell to 3.1 percent; and, in 2005, it fell to 3.0 percent. Since then, fourth-quarter-to-fourth quarter real GDP has never again reached as high as 3.0 percent. After next year, however, the CBO’s projections anticipate that the annual growth in real GDP will drop below 2 percent. “Rising interest rates and prices, along with the slower growth in federal outlays after 2019 projected under current law, restrain demand and thus keep the growth of actual GDP below the growth of potential GDP from 2020 to 2026, in CBO’s projections,” says CBO. In addition to projecting the percentage change in annualized GDP from one fourth quarter to the next, the CBO budget and economic outlook also projects the percentage change in real GDP from one full year to the next. By this other measure, according to CBO, real GDP will grow 3.0 percent in 2018. That would be the largest percentage change in GDP from one year to the next since 2005, when real GDP, measured this way, grew by 3.3 percent. In the years since 2005, real GDP by this measure peaked at 2.9 percent 2015. Thus, by this second measure, CBO is projecting real GDP will hit a 13-year high. 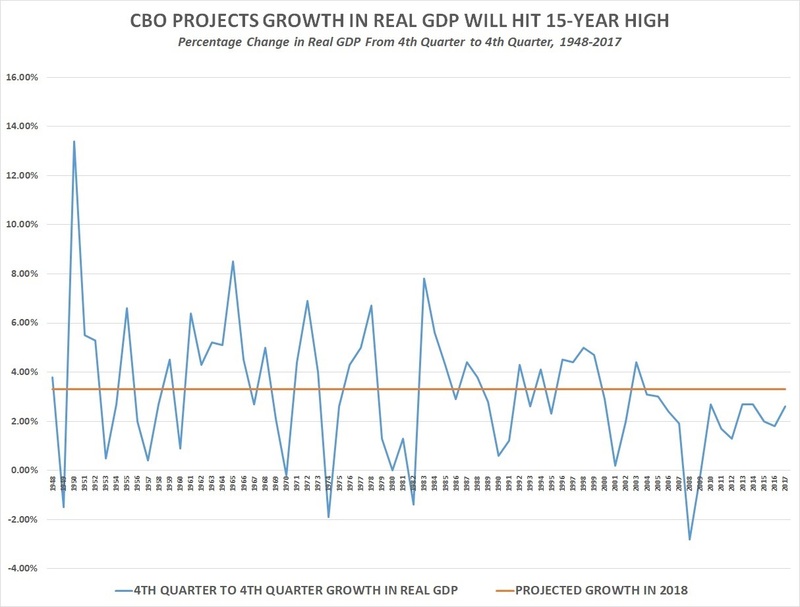 CBO confirmed that it was correct to compare its projection that real GDP would grow by 3.3 percent this year to the fourth quarter to fourth quarter numbers in the BEA’s Table 1.1.11. 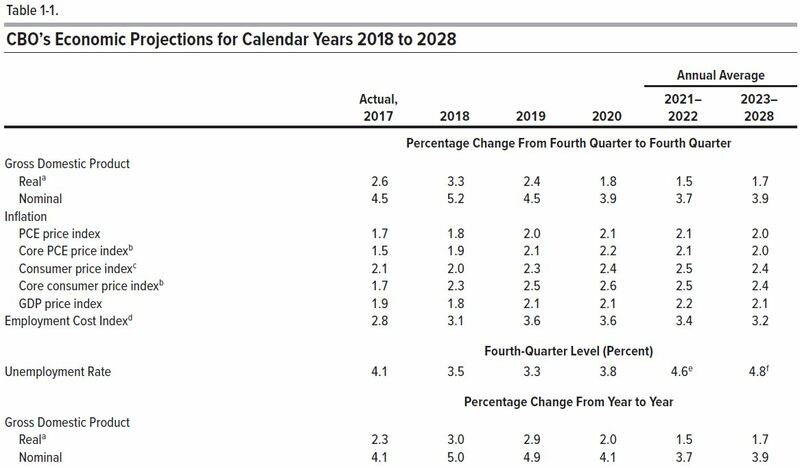 “CBO confirms the growth numbers in our forecast are comparable to the data in BEA’s Table 1.1.11, that our estimate of growth in 2017 is 2.6 percent (on a 4th quarter over 4th quarter basis), and that our forecast growth in 2018 is 3.3 percent (4th quarter over 4th quarter basis),” CBO told CNSNews.com.